You are currently browsing the tag archive for the ‘Ground Zero’ tag. The Alumni Spotlight feature highlights one of SPS’s proud graduates. We asked Nelson Franco (B.A. 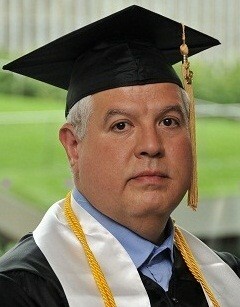 Communication and Culture, Class of 2012) five questions about his experiences before, during, and after SPS. 1. What was your background prior to coming to SPS? I had only taken one college course back in 1980. The second course was 24 years later (2004). I’ve had no change in career since 2004, but this was not my objective when going after a BA. 2. Why did you choose SPS and your program? 50% of my coursework was done at John Jay. The remaining courses needed to complete a political science degree were difficult to fit into my schedule. While searching for other CUNY colleges, I found SPS. Of course online courses worked perfectly for me, but I did change my major. This ended up being a closer fit to my current career so it turned out to be a double-bonus for me. 3. What is your favorite memory from your time at SPS? Prior to being this year’s student speaker, my favorite memory was visiting the mosque at Ground Zero for a research project. 4. Are you currently working in your field of study? What are your current career and /or life goals? My current career as Logistics Manager certainly exposes me to various business cultures around the globe. With my degree in Communications and Culture, this knowledge has certainly widened my tolerance of cultural differences with working others around the world. In addition, new technological tools experienced with my coursework have certainly helped in my current career. 5. Is there a message you want to share with your fellow SPS alumni? I believe that I could have completed my degree without the help of fellow students’ encouragement and support. However, it certainly would not have been as inspirational and fun. Thanks and congratulations to all! The CUNY SPS Online B.A. in Communication and Culture offers an interdisciplinary curriculum focused on critical issues related to communications, with special emphasis on new and traditional media. Students examine and evaluate social and organization culture, preparing them to launch or advance their careers in management, media and communications, social services, and international organizations. Find out more about this and other SPS programs by visiting our website or by attending an in-person information session. The next Online Baccalaureate Info Session will be held Wednesday, September 12th 6-8pm at the CUNY Graduate Center. Click here to register.